Fashion is what I’ve always wanted to conquer lately, I must discover how to wear nice dress that is age and time appropriate for me. I don’t like to wear those clothes that are way too young or old for my age. I need to be in the middle of between the two ages also classy and simple. I recognize it would be a huge fad for me since I ain’t a trend guru that just have a talent of mix and matching clothes and accessories, I need to be taught the nitty-gritty I assume. One thing I would establish is by picking the right accessories, jewelries, watches, shoes and more. Somewhat speaks about who I am when you first look at me on it, simple and approachable. I’m blessed whenever I have planned and something came up; I am working on a product review about a nice Leather Charm Bracelet. I have freshly acknowledged the merchandise and I was very impressed of the quality, although I have three more of the leather charm bracelet, I have a new color added to them. It’s white, with some nice charms on it. 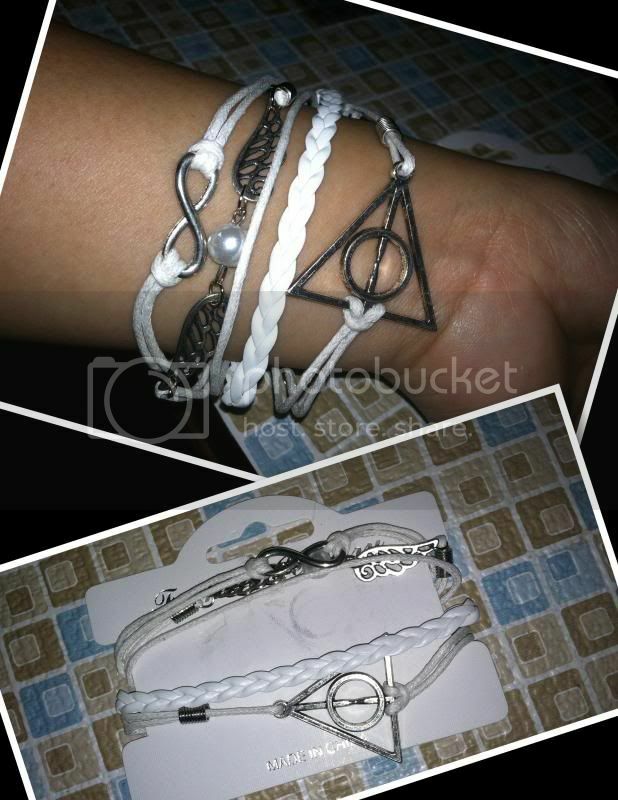 I never expect to get the DEATHLY HALLOWS charm included or that’s how I recognized the charm. Materials include Leather, alloy, wax linen cord, suede. It is a very nice accessory for daily activity, very handy and pretty too. Something, I would always consider wearing every day. I hope that through the simple and easy way I can find fashion easier. If you wish to get a nice Charmed Bracelet, you may always visit them @ http://pennyauctionscanada.com to see more. THat is so cute and I love that it is white! I love charm bracelets. The ones you got looks so pristine. It will be so perfect for spring/summer. I like it! It does make a nice accent in any type of outfit. I love charm bracelets! It looks lovely on you, I believe charms doesn't choose any age. It's how you carry yourself. Unfortunately, I can't wear any bracelet much because of my skin asthma. As much as I love to try one, I just can't more so, it's leather. Every one wants to look stylish and trendy. Accessories play an important role in augmenting your look. Bracelets are that piece of jewelry that both men and women used to wear. Above charm bracelets are nice and beautiful.